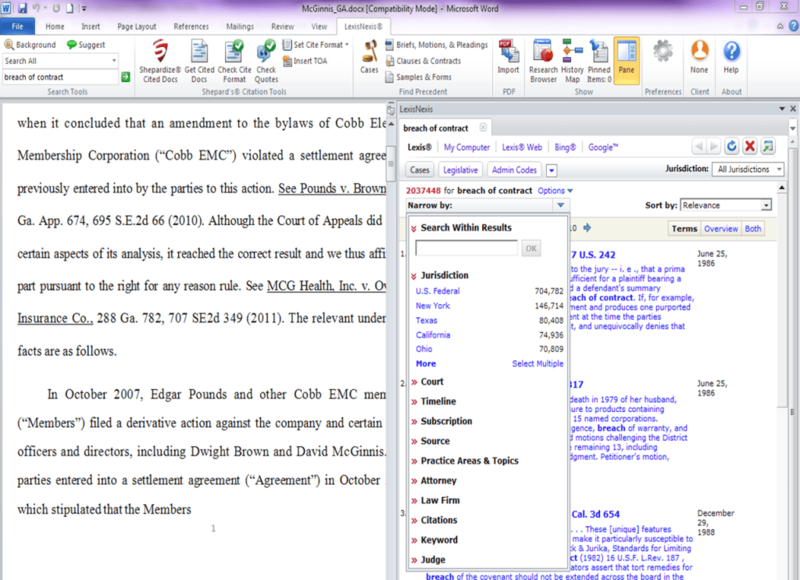 It has been three years since LexisNexis introduced Lexis for Microsoft Office, a product that integrates the legal research tools of Lexis.com directly within Microsoft Word and Outlook. In the years since, Lexis also launched Lexis Advance, its next-generation legal research platform. But the Office integration remained tied to Lexis.com. 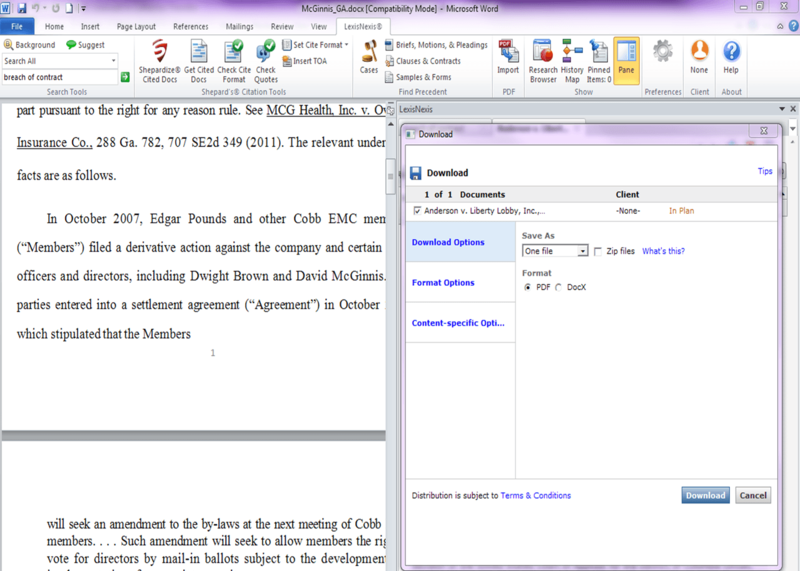 Yesterday, Lexis released a new version of Lexis for Microsoft Office that integrates with Lexis Advance. Because Lexis Advance offers features and functionality not available through the traditional Lexis.com research platform, that means that Lexis for Microsoft Office now incorporates many of those added features and functions. For the time being, Lexis will continue to offer the version that integrates with Lexis.com. However, in keeping with its goal to migrate all its products to the Advance platform, all future development for the Office integration will focus on the Advance version. The basic idea of Lexis for Microsoft Office remains the same. 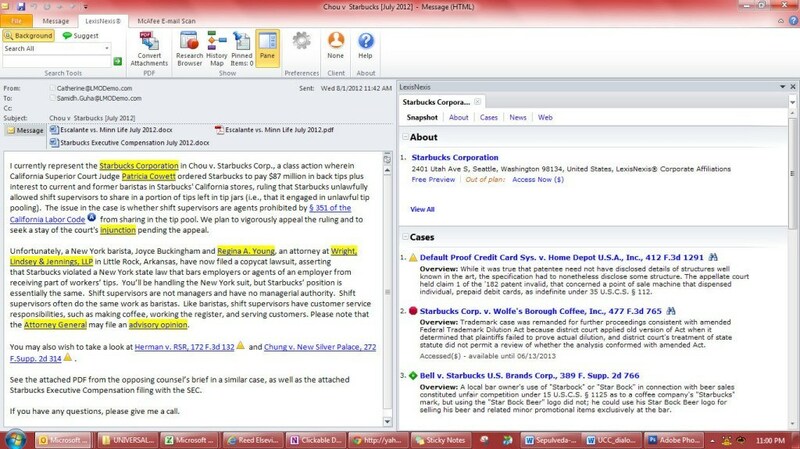 The product splits the screen within an Office application and adds buttons to the ribbon bar that bring search and citation functionality directly into Word or Outlook. For a lawyer drafting or reviewing a brief or other legal document, the result is a more natural and efficient workflow. Rather than jump back and forth from document to research platform, the two work in unison. As an example, say you have just received an opposing party’s brief that you need to review. Click “Shepardize Cited Docs” in the ribbon bar and the tool finds all the cites in the document, formats them as hyperlinks to Advance, and adds Shepard’s icons to signal the status of cases. Click on one of these added icons in the document to see the Shepard’s treatment in the right pane. Similarly, you could click “Get Cited Docs,” and the tool will pick up every citation in the document and present them in the right pane. As you move through each successive reference in the right pane, the document on the left moves to the location of that cite. If you are drafting a document, two tools you might find useful are “Check Cite Format” and “Check Quotes.” The Check Cite tool reviews all the citations in your document and verifies that they conform to the appropriate citation style. (You can set this to Bluebook style or use either New York or California styles.) The Check Quotes tool searches your document for quotes and matches it against the actual cited text to verify its accuracy. These citation tools are “smart” in that they recognize the placement of a citation and use the corresponding citation form. If you cut and paste text, the citations are updated to proper form. For example, if the text that contains the first reference to a case is cut and moved further back in the document, the resulting first reference is put in proper form and all subsequent references, including any that use “id,” are updated. Expanded content. The available research content now aligns with a user’s Advance subscription and includes additional types such as jury verdicts and settlements, expert witness analysis, administrative materials and administrative codes and regulations. Search preferences. Users can select alternative search configurations including the ability to toggle between natural language and Boolean searches as well as using search term synonyms and equivalents. Results review. Enhanced document display and more options to navigate within a document give users quicker access to the relevant content, for example jumping to document sections such as core terms, case summary and outcome. Document delivery. Additional print, download, email and formatting tools allow for more customized results documentation and information sharing. Use of Lexis for Microsoft Office requires an additional subscription beyond what you pay for Advance or Lexis.com. Lexis would not provide me with a specific price, but said that it is charged on a per-user per-month basis. Below are screenshots showing some of the features of the new release. 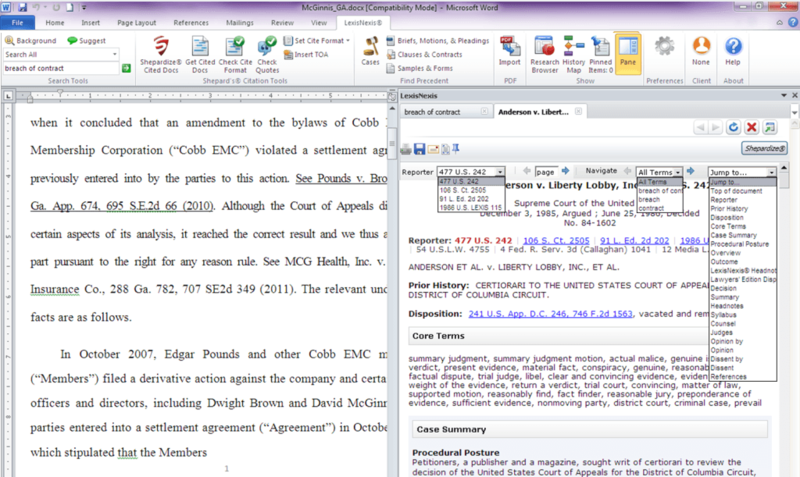 Search for cases from directly within Microsoft Word (click image for larger view). Integration with Advance adds new options for post-search filtering (click image for larger view). Advance integration provides new options for delivering and formatting documents found in research (click image for larger view). Get background information on cited cases as you view a document in Outlook or Word (click image for larger view).